Occasionally, I’m asked for “secrets” of writing a book. Although this isn’t necessarily what people are looking for, here’s a trade secret: most authors don’t go into a book project, particularly nonfiction, with the idea of adding new chapters and updating it for a re-release. On the contrary, speaking for myself, writing a book is usually so draining, mentally and physically, that I don’t even want to think about the subject again until the book is on store shelves. So, it would take something pretty amazing for me to want to revisit a project within a year of finishing it. Well, wouldn’t you know it, six months after More Than A Season hit the shelves, the Royals won the 2015 World Series, which made an update to the book a no-brainer. 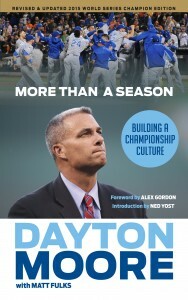 See, in the event you haven’t read it, More Than A Season, Dayton Moore’s book that I was able to help write, covers Dayton’s time with the Royals, through the 2014 World Series. The book offers behind-the-scenes stories of how Dayton (and the people around him) helped change the culture in Kansas City. Along the way, it gives the reader a look at Dayton’s childhood and college years, his time in Atlanta, and, perhaps most importantly, the faith and leadership philosophies that have guided him. Within 24 hours of the massive World Series victory parade in downtown Kansas City, though, Noah Amstadter, our original acquisitions editor at Triumph Books, and I were exchanging emails and phone calls about the possibility of updating More Than A Season. Again, nothing wrong with the original version, but the Royals winning the World Series put the closing chapter, if you will, on the book. To see where the Royals started in June 2006, when Dayton Moore became the general manager, to what we’ve seen with back-to-back World Series appearances (the first time in club history), winning it in 2015, the book deserved a re-release. So, here we are, 10 months after the original book hit the shelves, with an updated version of More Than A Season (version 2.0, as we’ve been calling it). Although the original book can continue to stand on its own as one of the books I’m most proud of helping write, the new book includes a new introduction, written by manager Ned Yost, a new preface from Dayton, a new “final” chapter, and some new fan letters at the back. You should start seeing the softcover edition of 2.0 on store shelves very soon, if they’re not already there, but if you’d like a hardcover, unsigned or even personalized by Dayton, you can order that now through the foundation by clicking here, or by going to the “Shop” page on our website. Once you go to our Square page to buy the book, you can get the original version, in softcover, or the updated version in hardcover. Throughout my career I’ve been blessed to work with — and get to know — some incredible and high-profile people, mainly in the world of sports. Several of those have been through book projects. Well, no offense to any of those people — or to myself, for that matter — but out of the 20-plus books I’ve written, perhaps the most powerful and most diverse book, and the one that challenged me most as a writer, was More Than A Season. Originally, it was a book that was going to stand the test of time. Even though I’d never imagined updating it within a year, I’m beyond ecstatic that we needed to add new chapters. We hope you enjoy it.